I’ve always been good at remembering special dates: when I met my husband (6/6/79) or the date my family left on a cross country road trip (7/26/70). I get it from my mother who was great at remembering the days beloved family members crossed from death to new life. 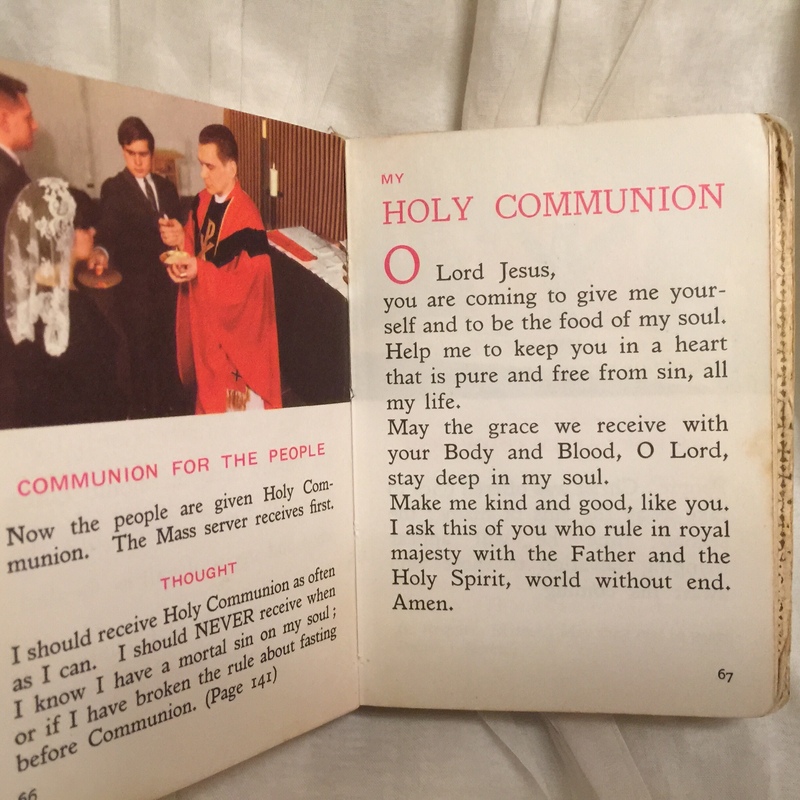 Last Wednesday was the 48th anniversary of my First Holy Communion. I have remembered it every year, even when I was away from the church. As a nervous seven year old, I wanted to be sure to follow all of the nuns’ instructions. All of the boys and girls were well-scrubbed and decked out in their white finery, even though it was November. Mom bought a special veil for me. It was much nicer than the standard issue headband veils that could be purchased through the school. It was a specially ordered and had a beaded crown. I wore it all day. I never wanted to take it off. My mom wouldn’t let me get white shoes– they scuff too easily. I wore black patent-leather T straps along with lacy tights and a dress with an heavily starched eyelet bodice. The skirt was a crisp white bell thanks to a crinoline slip and more starch. The dress was special and I still have it. I can’t believe how impossibly small it looks now. I was always one of the taller kids– the ones in the back rows of the group photo. We gathered in one of the classrooms before mass: girls separate from boys. There were at least 100 girls, so the black and white shot was taken from the other end of the room and included the pendant light fixtures on the ceiling. I distracted Christine who stood next to me, causing her to look sideways. Just prior to leaving for mass, mom panicked because she didn’t put on my scapular. It was too late to undo the dress, so she bundled it up and tossed it down the front. By the end of the day, it had worked its way to the ankle of my tights! How does something like that happen? I remember superficial details, but I can’t remember what it was like to receive the body of Christ for the very first time. I didn’t understand the gift of the Eucharist. How could I appreciate it? The gifts I sought were in my cards at the party that followed. It was the first time that I was the center of attention, and treated like I was someone special. As a seven year old, I didn’t see that Jesus was the gift, the center and the most special someone I could ever meet. Lord, please help me to always savor this holy gift. Allow me to focus on Jesus and not on myself. Give me faith to see beyond the superficial and to recognize the true gift of your son. I remember all the details of my first “Passion Play.” The Methodist Church I was baptized and raised in has an annual event in an outdoor concert arena that is uniquely “cut into” the woods behind the church. It is a fairly well known event held each year which reenacts the days leading up to the death of Jesus. I was 11 or so and seeing all the church members first practicing and then performing for a fairly large audience was so inspiring. Folks came and still come from all around to watch it year after year. No matter how many viewed the first one I recall remains the best of them all…and reminds me just how long and how special a relationship I have had with Jesus. Thanks for sharing your childhood memory. The seeds of faith are planted then whether we realize it or not.